Google Chrome will block audio autoplay on websites that use the Speech Synthesis API in version 71 of the browser. Google's stance on autoplaying content in Chrome is relatively straightforward: autoplay with sound is only allowed if the Chrome user interacted with the site previously. Currently, Chrome uses a Media Engagement Index on desktop that may allow autoplay on sites even if the user did not interact with the site during the active browsing session. The Speech Synthesis API, an API for creating text-to-speech output, is not subject to this policy. When you visit the linked test site, you will notice that Chrome will play audio on page load automatically. 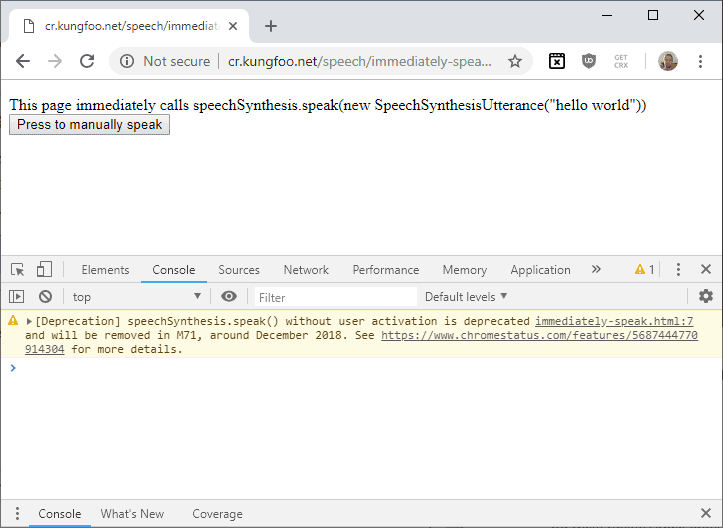 If you open the console in Chrome 70, the current Stable version of the browser, you get a notification that the part of the API that allows text-to-speech output without user interaction, is deprecated. Chrome continues to support text-to-speech, but users need to interact with content on the page first before audio can be played. If you open the linked example site in Chrome 71, you will notice that audio is not played automatically anymore. Other browsers, Firefox and Microsoft Edge, play audio on connect to the demo site. The introduction of autoplay policies blocked advertisers and shady websites from throwing autoplaying ads with sound or notifications to users. The Speech Synthesis API could be used instead by these sites to play audio automatically, e.g. to display ads or notifications, and use sound to get the attention of the user. Google admits that the deprecation of the functionality impacts sites that use API for legitimate purposes; the company notes, however, that the "majority of usage of this API was for abuse" and not legitimate purposes. Google plans to add functionality to the browser's sound autoplay whitelist to allow sites to play audio automatically using the Speech Synthesis API. Users who want audio autoplay on sites can enable the functionality again by whitelisting sites. It’s annoying. That’s why I use an addon that’s mutes all tabs by default and I whitelist the sites that are allowed to play audio, for example yourtube. If you’re on Chrome then there is no need for a seperate extension, just go to Settings -> Content settings, and turn Sound to off. Now sound is blocked on every single site. When you want to permit sound on a site, then click the padlock icon in the url bar and turn on sound for that one site. This is further confirmation running the latest Chrome x64 beta (currently Version 71.0.3578.62 (Official Build) beta (64-bit)) continues to be the way to go. You can already do that. You just can’t set it to be like that by default. It has to be site by site. Click on the lock icon and then site settings. But yeah, Google hates “power users”. I honestly dislike that term but I guess I am one. They’ve been ruining the design and limiting Android and their other apps and services. Just go to the Settings -> Content settings and turn everything to off/block. All of those things will then be blocked by default for all sites. When you want to enable one specific thing for a site, then just click the padlock icon in the url bar and enable something from there. You can also click the padlock and “Site settings” at the bottom to open a new tab that shows the entire list of Chrome permissions for just that particular domain, and you can change all the permissions from there too. It is a scourge. Any media that automatically plays is a Bad Thing, but audio is perhaps the worst.